For the past several months I've been studying traditional painting techniques and trying to apply them to my digital works. In particular, I've favored oil painting techniques, such as underpainting and glazing. 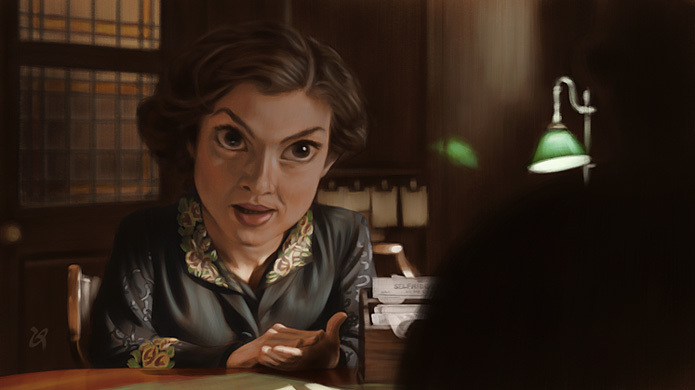 The following example was painted in Manga Studio 5 and comes from a series of paintings based on stills from the second season of 'Mr. Selfridge' (the rest of which can be seen here). 1. 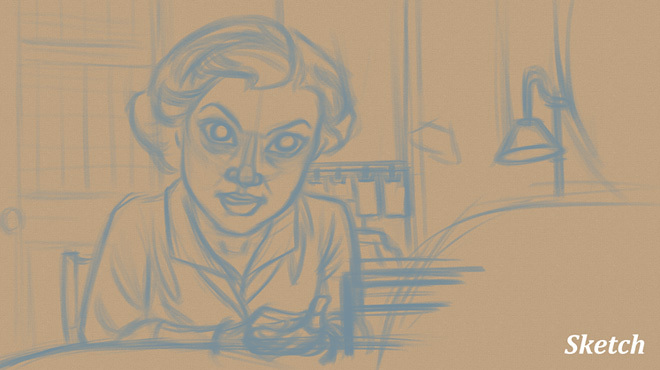 Sketch: I use a light blue with an expressive brush/pencil. 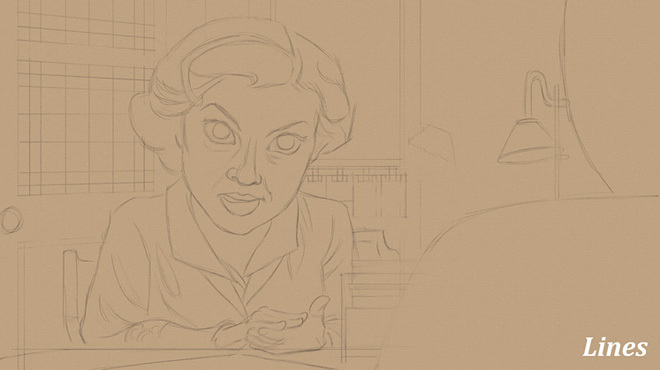 Using light blue is common among animators and comic book artists (originally as a 'non-photo blue'). I like it because it feels temporary and I don't mind erasing the sketch after inking. I work on a tan ground since monitor white blows my eyes out (I'm prone to photophobia). 2. Lines: I've found that a simple line works best when I'm aiming for a painted look. I keep the lines on a layer above the painting since I paint faster when I can see the lines clearly. I use a layer mask to selectively erase the lines while painting. 3. Imprimatura/Stain: I used a Burnt Sienna/intense orange to stain the sketch to provide a vibrant ground for the underpainting. The tan ground still shows through too. 4. 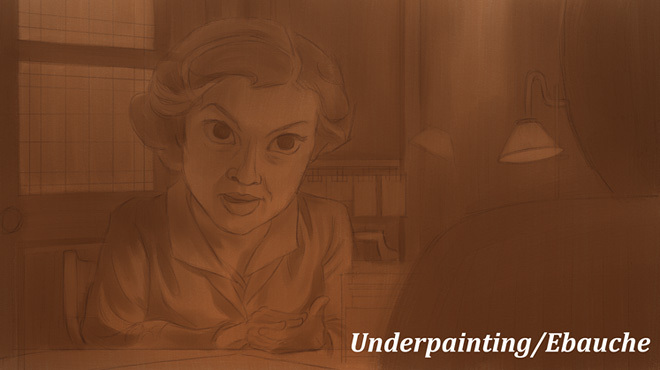 Underpainting/Ebauche: Burnt Umber was used to build up the underpainting on a new layer. I start with a low paint density to simulate working with thinned paint. 5-7. 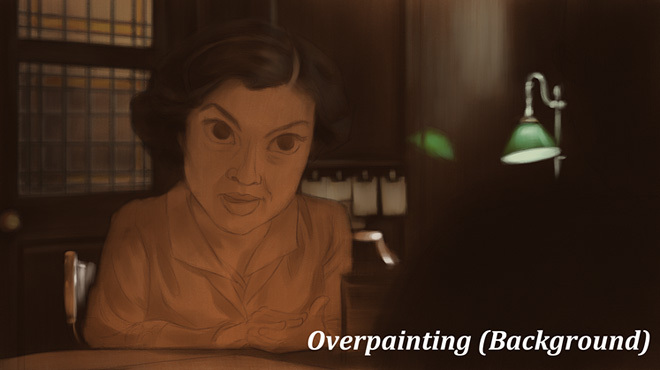 Overpainting: I tend to paint forward from the background, creating a new layer for each color. Though conventional wisdom says otherwise, painting traditionally is often a multi-layer process. Especially if you're using a glazing medium such as acrylic paint. Painting each color on a new layer allows me to erase/thin/push around the paint while I work. The effect is similar to painting on top of dried paint. 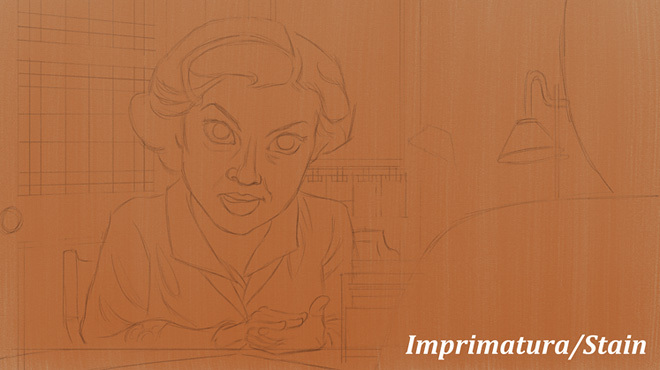 This method also allows the previous layers, particularly the underpainting, to show through in the final piece. 8. 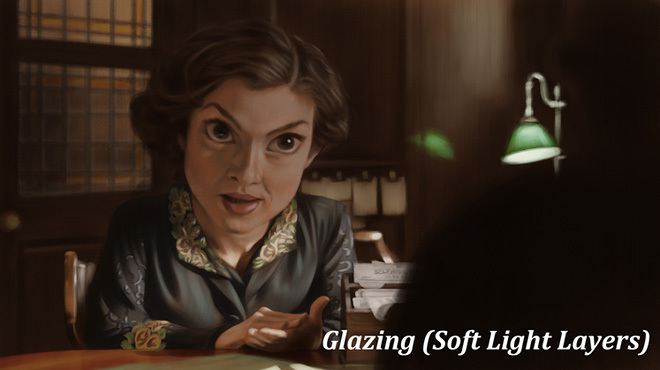 Glazing: I like to paint on layers set to 'soft light' to simulate glazing, which can be difficult to recreate digitally. The effect is subtle in this particular piece but can be quite dramatic in others. 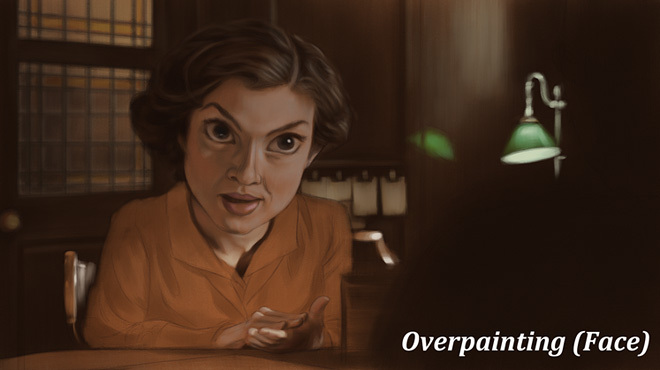 I mostly glaze to deepen shadows and add colors, but with digital paint I can 'glaze' highlights as well (which can be seen in her vest/blouse and the lamp). 9. 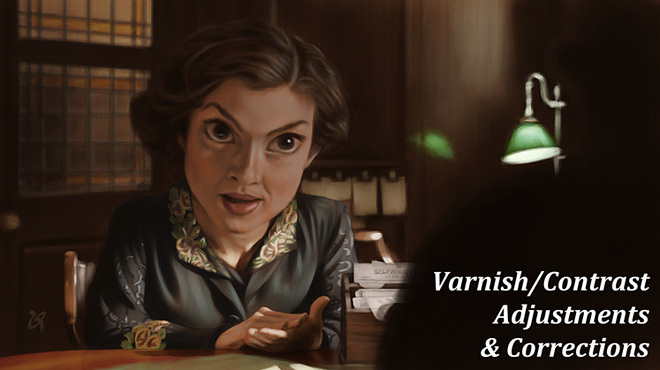 Varnish/Contrast Adjustments: Much like a real varnish can add lustre and depth to a real painting, various contrast adjustments can add a finishing touch to digital paintings. I usually punch up the brightness and contrast a bit but try not to get too carried away. I also use an Unsharp Mask filter to sharpen details and brushstrokes. Though this piece was painted in Manga Studio, many other applications such as Photoshop or Painter can simulate the approach. If you'd like to see the entire series of these paintings along with notes recording what I learned while painting them, you can see my post 'Selfridge's'. James Gurney's blog also serves as a great resource for traditional painting techniques, along with his books Color and Light: A Guide for the Realist Painter and Imaginative Realism: How to Paint What Doesn't Exist.